At the same time, Amish families do enjoy taking trips and visiting new places, and have done so in an increasingly conventional manner in recent years. Typically, Amish ‘vacations’ have consisted of visits to family, or to an Amish settlement in another community. Amish will travel in large groups so as to reduce costs. The family and community element make time away seem more acceptable, as opposed to a trip purely devoted to pleasure-seeking. Amish may travel out-of-state for weddings or funerals, or to visit family or church members who have moved away to new settlements. With the rise in disposable income due largely to business involvement and work in non-farming occupations, however, Amish have increasingly taken more conventional vacations. Amish have in recent years taken more trips to areas considered more conventional vacation destinations, such as Niagara Falls or Washington, DC. Such trips are often connected with places of historical or national interest. Amish may also sometimes be sighted on beaches as well, in full Plain attire. Amish are unlikely to be found in theme parks, movie theaters, or other more worldly places of amusement, however. Amish journey to their destinations in a variety of ways. Amish often hire an “Amish taxi”, which in many cases is a 15-passenger van with a non-Amish driver. An Amish family may share the cost with another family to make the trip more economical. Other Amish may go by train, traveling long distances and spending up to 3 days en route to a destination. Amish often travel to Mexico and Canada by train. Another heavily-used transportation option is the bus. Some Amish will travel by charter bus for longer trips, while others go by Greyhound and can often be seen in bus stations in the downtown areas of large cities. 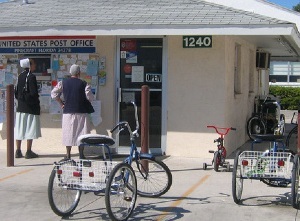 One place busloads of Amish travel in the winter months, in particular, is Pinecraft, an Amish and Mennonite-inhabited neighborhood in Sarasota, Florida. Pinecraft is jokingly known among Amish as the home of “the newly-wed and nearly-dead”, reflecting its status as a vacation and retirement community in some Amish circles. Not all Amish travel to Pinecraft, however, and some Amish frown upon the practice. Pinecraft does attract a mix of Amish, as is evident by the different styles of dress. It is a popular destination among businesspeople and Amish of larger settlements. Pinecraft is also unique in that Amish here do not use the horse-and-buggy, but instead get around on oversized tricycles. There exists interest among some Amish to visit their ancestral homelands in Europe. For a lucky few, this dream may come true. In such cases, Amish may travel as part of a tour group, and visit areas of historical significance to Amish society—thus making such a trip more acceptable in some eyes. Places Amish are often keen to visit include regions of Germany, Switzerland, and France where Amish communities once existed. Do Amish fly in airplanes? One may wonder how Amish travel across the ocean on such trips. Travel by boat may be the only acceptable option for Amish, a journey that may take up to 10 days. Amish generally do not fly, seeing air transportation as too worldly. Most New Order Amish, however, do permit flying. Another popular vacation outlet for Amish is found in the great outdoors. Many Amish men are avid hunters, and numbers of Amish maintain a piece of hunting land, sometimes within buggy-driving distance of their home, or even at a longer car drive outside their communities. Amish men hunt with guns and bows, and seek out deer, turkeys, and other game. Amish men shop at hunting outlets such as Cabela’s. Some Amish even take hunting trips to the West in pursuit of larger game such as elk and moose. Read more here on Amish and hunting. Fishing trips are another popular vacation option. In some cases, this means deep-sea fishing, while in others, angling in local rivers and ponds. Family camping trips are another popular option as well. Fishing, hunting, and camping give Amish a chance to admire God’s creations while spending time in nature. It is true that Amish life is tied close to home. Many Amish stay with traditional “vacation” outlets, and some, particularly farmers tied to a dairy, take few if any leisure trips. At the same time, some Amish do enjoy more non-conventional trips. With the move away from the farm and into business, Amish have been freed of the obligations that a regular milking schedule creates. They have also enjoyed higher disposable incomes. These are two factors which have led to an increase in both the number and variety of vacations. Regardless of occupation, Amish typically appreciate a chance to visit new places and learn about life outside their home communities. This may take the form of visiting new Amish communities, places of historical significance, or natural settings. 9 responses to Do Amish go on vacation? Thanks for compiling all the info!! Fixed it Dena–thanks for letting me know! Lots of Amish traveling through Chicago? We recently witnessed MANY Amish groups traveling in Chicago about June 1. Any ideas why? I have seen Amish at Silver Dollar City. It is known for being a Christian company and it is a conservative, family-oriented theme park that is like stepping back in time (for most of us). I also saw some Amish at Bass Pro Shops in Springfield. I’ve been at Silver Dollar City. Lots of fun ! I saw some on a cruise ship. Just curious was that maybe an Alaska cruise or something warmer? Leave a reply to Do Amish go on vacation?